Many soldiers were returned to Britain during the First World War with a variety of wounds. Recuperation could be difficult but for those sent to Summerdown Camp in Eastbourne, women from the Almeric Paget Massage Corps led by the Angel of Summerdown were on hand to speed their recovery. The use of massage as a means of treating wounded soldiers during the First World War was pioneered by the trained women of the Almeric Paget Militaey Massage Corps (A.P.M.M.C) under the supervision of Pauline Paget. Life on the Western Front for British soldiers could be both mundane and dangerous. Of the British soldiers that went to war eighty-eight percent returned from the Western Front alive and would only spend a few days at a time in the front line trenches. However, whether they were to be involved in a major offensive or just in the wrong place at the wrong time, the threat of death or serious injury was a serious one. In the region of 1.6m British men were wounded during the war. Some of these wounds would be serious enough to see them evacuated from France completely and returned to Britain for convalescence. Much of what was Summerdown Camp has been developed into housing since the war but, at its peak the camp covered a large area to the north-east of Eastbourne. Nestled into the South Downs Summerdown opened in 1915 as a convalescent home for wounded soldiers. At its height Summerdown contained 3,500 wounded men who were known locally as the ‘Blueboys’ on account of their issued uniforms. Whilst the men in the camp were confirmed as wounded, some of their wounds would not necessarily be obvious upon appearance. Of course the men were still under military jurisdiction and curfews so it was important for the residents of the camp to be easily recognisable when out in the town. Furthermore, being a man who seemed physically fit yet not in army uniform could result in pressure being placed upon them by civilians to join the army. The handing out of white feathers by women to men suspected of being too cowardly to join the army has become infamous today and was extremely humiliating at the time. Treatment of wounded men during the First World War was often difficult, time-consuming, and experimental. The sheer numbers and types of wound that could be suffered often overwhelmed the resources and abilities of medical staff at the clearing stations around the front lines. Upon arriving back in Britain, treatment for a multitude of wounds could be provided. Many of the treatments pioneered during the war have become the foundations of modern medical science including skin grafts and artificial limbs as well as psychology. The treatment given to men at Summerdown included regular sessions with the women of the Almeric Paget Massage Corps. Initially founded by Almeric Paget and his wife Pauline Page Whitney, the Massage Corps offered the services of 50 masseuses to the War Office. Once this offer had been accepted numbers of Almeric Paget masseuses increased steadily across the war until reaching 2,000 during 1918. The corps itself would change over the war as well, becoming the Almeric Paget Military Massage Corps in 1916 and the official body for all massage services to the army. From 1917 members would also be sent overseas to provide treatment in France and Italy. Women in the Corps were easily distinguishable from women in the regular Nursing Service. The wore a simple uniform with the badge of the A.P.M.M.C on their left arm, whilst the presence of red bars on the shoulders denoted seniority. The treatment they gave was a mix of massage and electrical stimulation. Given the number of men requiring massage the work was often very physically intensive. Electrical work was less demanding. To stimulate muscle movement they would usually use the Bristow Coil. Whilst portions of these treatment now seem outdated by modern standards they did lay the foundations for much of what we now understand as physiotherapy. Before her marriage to Almeric Paget, Pauline Page Whitney had been born and raised in the United States. With the formation of the A.P.M.M.C and the outbreak of the war, she became increasingly active in the organisation and was regularly seen at Summerdown Camp organising the corps there. So taken where the patients with her and the masseuses that she was widely referred to as the ‘Angel of Summerdown’. 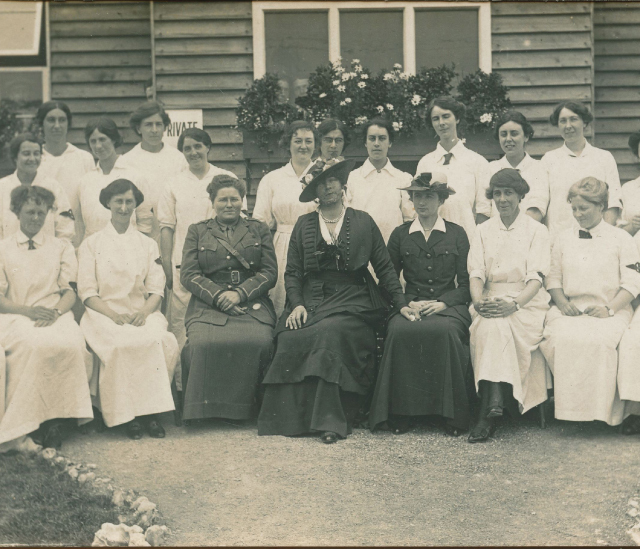 Primarily based in her house at Berkley Square in London, Pauline Paget maintained a strong interest in the women of the A.P.M.M.C and the services they provided to wounded soldiers. However following three weeks of illness she died in November of 1916 and, as a result, never lived to see how important the organisation would become. News of her death was published in the New York Times and a monument to her still exists in the grounds of St Mary’s Church in Hertfordshire.